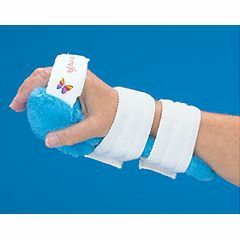 Pucci Air Hand/Wrist Orthosis reduces flexion at the wrist and increases extension of the fingers. Shell is made of clear blue polypropylene with a flexible aluminum bar embedded inside. The inflatable hand component attaches to the base. Inflate to gradually lift the fingers away from the palm. Kit includes one soft fabric cover, laundry bag and hand bulb inflator. One size. Specify Left or Right when ordering.